I have struggled quite a bit with low stomach acid. Burping, mild nausea, and decreased appetite were not uncommon over the years. This was particularly true around bigger meals (since more stomach acid is required as the volume of food in your stomach increases), which was really not fun since I do love to eat! While eliminating sugar and high-lactose dairy went a *long* way toward improving my symptoms after transitioning to a Paleo-style diet, I struggled with finding ways to actually increase my stomach acid and boost digestive juices in general. Taking straight HCL never worked well for me. Most capsules have far more in just one dose than I needed. And if heartburn is a problem, you probably know from experience that adding straight HCL can actually exacerbate the issue. I wanted a more gentle approach. Doing lemon water and/or apple cider vinegar works from some people as a pre-meal boost. But these options are not as stimulating to your “digestive juices” as bitter compounds. The first time I tried bitters was in 2015 (first brand was Herb Pharm <— which looks like it was recently reformulated), I was shocked. It was like the bitter receptors on my tongue had laid dormant for YEARS. I had plunged head-first into the use of bitters (like I do with most things) and likely took too high a dose for just starting out. Everything tasted bitter for a solid 3 days. It was a woeful, unpleasant few days of meals but it opened my eyes to how lacking my diet had been when it came to bitter compounds. The bitter taste is proven to stimulate stomach acid secretion and increase bile & saliva production. All important things when it comes to the start of the digestive process. According to our friends over at SCDLifestyle.com, many digestive problems could be solved by simply boosting that initial breakdown of food that happens in the stomach. This article from them can help you identify if you are dealing with low stomach acid. I noticed an immediate increase in my appetite and a huge decrease in burps upon eating. I also loved the taste of bitters in my water and kept up the habit daily. So much so that I felt I should try making them at home rather than spend the $40 or so a month that was required to keep up a steady supply. If you *are* dealing with a low stomach acid issue (and even if you aren’t), you may benefit from adding bitter compounds to your diet. Whether it’s in a more natural form like dandelion greens or endive with your dinner or a more concentrated source like the recipe below will all depend on what you decide your body needs. Homemade tinctures are dead simple, they just require patience. Always use a minimum 40-proof vodka (if you can get your hands on some, 50-proof will yield a stronger tincture) and don’t let any water get into your jars. This means buying herbs/roots from a reputable sources that have a safe dehydrating process. Do not use fresh herbs, as it’s a very different process with different temperatures and steeping times. I trust Mountain Rose Herbs for dried herbs but also use local shops, when possible. Local to Phoenix is Desert Sage Herbarium and Portland has Clary Sage Herbarium. I recommend searching out one in your local area since they often will sell as little as 1/2 ounce portions of whatever herbs/roots you need (and are often more affordable than buying online). Which really helps in a recipe like this one where not much of each is needed. Mountain Rose Herbs carries all the ingredients below but you’ll have to make a double batch, as they only sell them at a minimum 1 ounce portion. Thankfully at just a couple bucks each. Since the shelf-life of vodka is near eternity and it also acts as a preservative, the resulting bitters will last in your cupboard for a VERY LONG TIME if you do end up with a double batch. One quart of completed bitters costs me approximately $15 for the herbs (when sourced locally; this number is higher when using MRH) and $10 for the vodka, for an average $0.78/oz. Compare this to the $10/oz cost of most common bitters brands. One quart will last approximately 260 days if one person has 3 servings daily. Introduce bitters slowly. Start with a few drops in 12 oz. water and increase to a full dropper over the course of 1-2 weeks. Use dried herbs! Fresh herbs require a different process than what’s listed here. Use 40-proof vodka or 50-proof if you can find it & don’t mind spending the extra for it. You can opt for potato vodka for a 100% grain-free tincture. Although it is inherent in the distillation process — the process to make vodka — that no gluten peptides (or anything resembling grains) are remaining in the final product. Read more here. Essential oils are optional but can give your bitters more of a “punch.” I like to add peppermint EO and DigestZen EO to mine. Arrowroot or tapioca starch are recommended to keep the vodka and essential oils emulsified. Bitters will stimulate bile and increase saliva and stomach acid production. They can also help with nausea or upset stomach. Not all of the ingredients listed are required for a good bitters tincture, it’s just a combo I enjoy. See the note at the bottom of the recipe to adjust for what you have available. Read this article to decide if you could benefit from digestive bitters. Stir the herbs/roots together and divide equally between 2 glass quart-sized jars. If the jars are filled more than halfway, portion off the herbs into a third jar. Ideally you want 1/3 – 1/2 full of herbs. Top both jars off equally with vodka. Depending on your exact jar size and volume of herbs, you may have excess vodka. Cover the jars and store in a cool, dark place for a minimum 6 weeks. If you have the time/patience, allowing for a full 12 weeks is ideal. 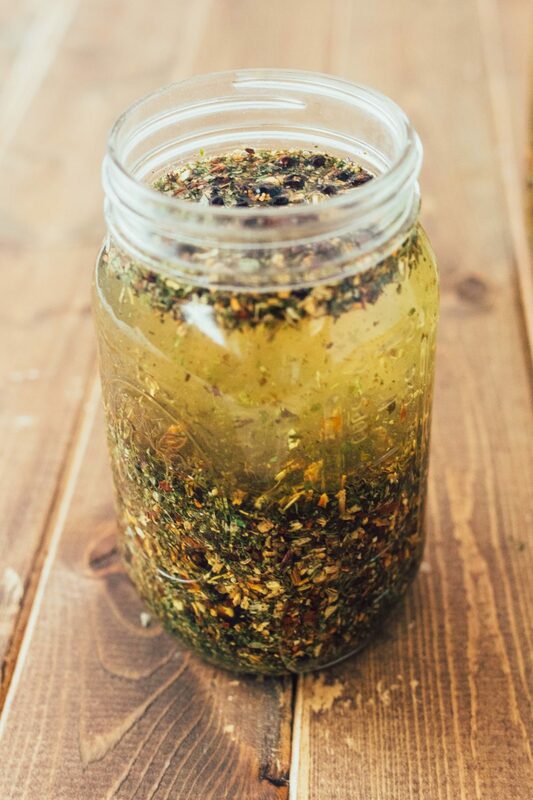 If accessible, shake the jars every couple of weeks to agitate the herbs (not a requirement). Strain the bitters through a nut milk bag, cheesecloth, or a thin kitchen towel. Squeeze the bag/cloth to extract as much liquid as possible. You should have just over a quart of bitters. Discard the herbs. The bitters are now ready to be used! I like to dose out 2 oz. at a time into a dropper bottle for easy everyday use. To use: squeeze one dropper full of bitters into 12 oz. filtered water. Drink 30 minutes before a meal. Optionally, you can add about 50 drops of peppermint essential oil and 1/2 teaspoon arrowroot starch per quart of bitters. Seal and shake vigorously to emulsify. The starch will help keep the essential oils from just sitting on the top of the vodka. Shaking will be required with each use. Note: any combination of these herbs will work. Don’t worry if you can’t access all of the above listed. Other less common herbs I have worked with & enjoy are: angelica root, gentian root, and hyssop. They can be added or swapped in at the same 1/2 oz. volume as the others. I am taking a drug for treatment of multiple myeloma and have been told by my oncologist to avoid herbs. Can bitters be made with ingredients such as cinnamon and citrus peel, etc. rather than herbs? Hey Jan, all the ingredients listed have some level of bitter quality, though some more than others. You can always take what you can use and omit the rest from this recipe. Maybe doubling up on the ones you *can* tolerate. Do you put seeds whole in the mix or do you need to grind them to pulver? Woul Milk thistle seeds be a good addition? Is the tinctura more effective if the alcogol percentage is higher? I put everything in whole! If you grind, it might be hard to sieve out later. Milk thistle would be a good addition, as it has some bitter notes. A higher alcohol percentage doesn’t make it more effective but it does shorten the time needed to steep the herbs. I made this today! I left out the peppermint leaf since my husband doesn’t like peppermint and I want him using the bitters too! I plan on giving some away as Christmas gifts, since they will be ready on Dec 16! Nice! Great gift idea. Let me know how you like the flavor when it’s ready!